Olly Medwynter (centre, blue) scored for Peterborough Sports at Rothwell Corinthians. 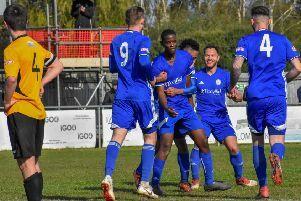 The unstoppable Peterborough Sports machine is now a maximum 10 points away from back-to-back United Counties League titles. Sports have eight Premier Division matches to get them starting with a home fixture against Oadby tomorrow (March 18, 3pm). Sports took their current unbeaten run to 18 matches -just five short of a club record set when winning the Division One title last season - with a 4-1 win at Rothwell Corinthians last weekend (March 11). Sports laboured at times in difficult conditions, but eased clear in the second half to clinch a 29th win in 34 league matches. Rothwell are one of the few teams to have taken points off Sports this season having drawn 0-0 at PSL before Christmas. Sports’ scorers were Stuart Eason, Josh Sanders (penalty), Mark Jones and Olly Medwynter. Deeping Rangers are Sports’ closest challengers, but remain 12 points adrift despite an impressive 3-0 win over Eynesbury Rovers last weekend. Scott Coupland scored twice as Deeping followed Sports in passing 100 goals for the Premier Division season. Deeping, who visit Sileby on Saturday, are seven points clear of third-placed Yaxley who pipped Sleaford 2-1 at In2itive Park on Tuesday (March 14). Strikers Phil Stebbing and Dan Cotton scored for the Cuckoos who are now unbeaten in four Premier Division matches. Yaxley have a tough game at in-form Newport Pagnell tomorrow. After a two-week break Peterborough Northern Star should be back in Premier Division action against Cogenhoe at Chestnut Avenue. Division One South: Spalding Utd v Belper Town, Stamford v Stocksbridge Park Steels. Premier Division: Holbeach United v Northampton ON Chenecks, Huntingdon Town v Boston Town, Newport Pagnell Town v Yaxley, Northampton Sileby Rangers v Deeping Rangers, Peterborough Northern Star v Cogenhoe United, Peterborough Sports v Oadby Town, Wisbech Town v Harborough Town. Division One: Thrapston Town v Bourne Town, Woodford United v Blackstones. Division One Braintree Town Res v Wisbech St Mary, Team Bury v March Town United.